One of my favorite year-round indoor gardening activities, if it can be called gardening, is sprouting. Not only is it fun and inexpensive, but the results are amazing. In the middle of a long cold winter, there’s nothing more fun and satisfying then growing something crisp and fresh on your own countertop with no special equipment required. I think I was inspired to sprout this past week because I had been preparing my garden for the summer’s bounty, but sort of felt disheartened that my first picks of the season were still over a month away. The remedy… sprouting! 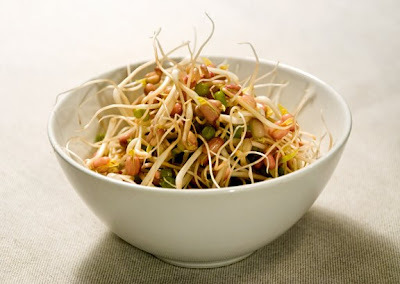 If you’ve never sprouted before then start with mung bean sprouts – these are the typical “no-frills” bean sprouts that can be found fresh at every megamart across the country. Once you grow your own you’ll never buy the limp flavorless bagged variety again. You’ll need to get your hands on some dried mung beans; I get mine in the bulk section of Whole Foods. About a ½ cup is all you’ll need for a pretty good sized batch and this shouldn’t cost more than a dollar – a steal! For equipment, you’ll need some kind of container with a flat bottom with lots of holes for drainage. I use a recycled plastic produce container (my husband used his cordless drill to make lots of 3/16” holes in the bottom, spaced approx ½” apart), but plastic quart-sized strawberry containers usually already have holes in the bottom and work well too. I use the lid of my container as a tray for my sprouting container to sit on, but any shallow tray will do. In a medium size bowl cover ½ cup of mung beans with 4 inches of water. Allow to soak overnight. 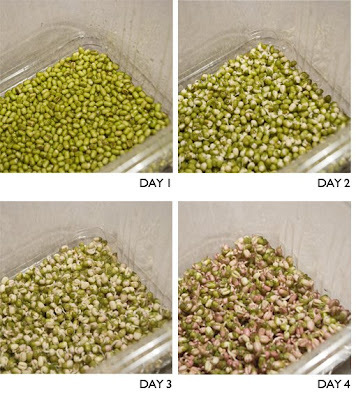 Morning: Drain beans and spread in an even layer in your sprouting container. Place the container on a tray to catch any drips and set anywhere indoors at room temperature in low light. Evening: Rinse - using your kitchen faucet sprayer, keeping the water pressure low, rinse the beans with water for approx 1 minute. Place back on its tray. Rinse once in the morning and once in the evening. Rinse in the morning and allow to dry thoroughly for at least 4 hours. Your sprouts are now done! Place in an airtight container and store in the refrigerator for up to 2 weeks. Bean sprouts are great in salads and stir fries, or try them in one of my favorite healthy recipes, Vietnamese Summer Rolls. No matter how you use them I’m sure you’ll agree that they are a hundred times better than the store bought variety and as an added bonus, much less expensive! Start by making the sauces. For each sauce place all the ingredients in a small food processor. Puree until smooth and pour into a small bowl. Rinse processor bowl in between each batch of sauce. Set all three sauces aside at room temperature. In a bowl whisk together the eggs, salt, chives, and 1⁄2 cup water. Spray a nonstick skillet with olive oil spray and warm over medium heat. Pour 1⁄2 cup of egg mixture into the center of the pan and swirl to spread evenly. Cook for 1 minute and flip. Cook for another 30 seconds then transfer to a cutting board. Don’t worry if it breaks or tears. Repeat with the remaining egg mixture. Should make about 4 thin omelets. Cut the omelets into rough 1⁄2” ribbons. To assemble the rolls, fill a shallow dish with hot water. Soak one rice paper wrapper until soft, about 30-60 seconds. Carefully transfer the wrapper to your work surface and lay flat. Sprinkle with 1⁄4 teaspoon of sesame seeds. Place approx 1⁄4 cup of bean sprouts on the inner edge of the rice paper round, about 1” from the edge and leaving about 1” on each side. Top with a few pieces each of omelet, carrot, cucumber, red bell pepper. Place a couple pieces of lettuce on top of the pile. Bring the bottom edge over filling and tuck underneath. As you continue to roll, fold in the sides. Finish rolling, repeat and with the other rolls. Serve with the three dipping sauces. Enjoy! Like this summer roll recipe. I have been cooking Thai all summer. Where I live, it's hard to get 'fresh' anything unless you grow your own!!! 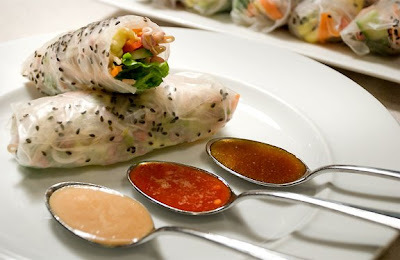 I have also made summer rolls with the ingredients stir-fried and with the addition of cellophane noodles! Will try your peanut sauce.